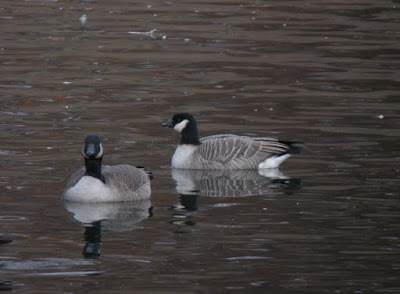 Shorebirder: Canada Geese? Cackling Geese? Or Hybrids? Before you read any further, I recommend that you have your favorite headache remedy handy, because you might need it. 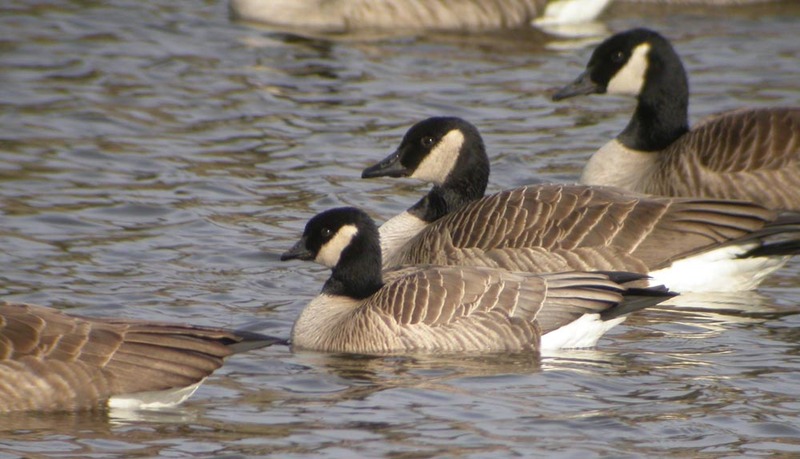 For some background reading on this problem, check out David Sibley's blog post about a confusing flock of white-cheeked geese he encountered in Massachusetts around this time last year. Also, there was recently a "problem goose" found by Frank Mantlik in Stratford. View my post and Frank's really nice photos. I suggested the bird might represent a "Lesser" Canada Goose or hybrid rather than a Cackling Goose. After getting a few more opinions on it, there actually seems to be a bit of a consensus...that it is not really identifiable and may represent a hybrid Canada x Cackling Goose, as it does not fit neatly into any one particular Canada or Cackling form (as far as we know now, anyway) and shows features of both species. And more background...here are some examples from past years of "Richardson's" Cackling Geese (Branta hutchinsii hutchinsii) I have photographed/digiscoped in CT. These classic-looking birds are small with a tiny, short bill, short neck, usually squared-off head, and gray tone to the upperparts (often described as "frosty"). The breast color is variable and sometimes shows a white collar between the breast and the neck sock. So that's what Cackling Geese in CT usually look like. "Richardson's" is the only subspecies of Cackling Goose expected here (though there have been, I believe, two records now of "Taverner's" Cackling Goose in the state). Anyway, there have been large numbers of Canada Geese around Wallingford, CT this autumn. My single high count was 1700 birds at one location a couple weeks ago. There have been at least a few "Richardson's" Cackling Geese among them, just like the birds photo'd above. On Sunday, Nov 22, I stopped by MacKenzie Reservoir in Wallingford for another check and found a flock of about 180 Canada Geese somewhat close to the road and in nice afternoon light. Upon studying them I found one classic "Richardson's" Cackler. But that was not the only small or short-billed bird in the flock. I soon realized that this flock had "Canadas" of all sizes, some bordering dangerously close to Cackling size. Not just a couple birds here and there...a significant portion of the flock was puzzling...not our typical migrant Canada Geese, yet obviously not Cackling Geese of any form I knew of. I called Greg Hanisek who I knew was nearby, so he came by to study the flock with me. We asked ourselves what these birds were as we marveled at the number of small birds present. Interestingly, this flock of 180 geese was largely separate from the 400+ others on the reservoir at the time, making us wonder if this particular group might have originated from the same area. First, below are images containing the hutchinsii Cackling Goose, to give an idea of what that bird looked like (marked with asterisk). The following photos are of the rest of the flock. I've tried to represent the variation in size here, not just focusing on the smallest-billed individuals. Click on the photos to enlarge them, and take a scan through each to appreciate the variation. I took a handful of images of that small goose that has the greatly reduced white cheek. You'll see it pop up again in some of the images below; same bird. Greg noticed that the center bird here had a slight stricture to its neck. Not sure what would cause that. It did happen to have a rather small bill and square-shaped head. So there you have it. 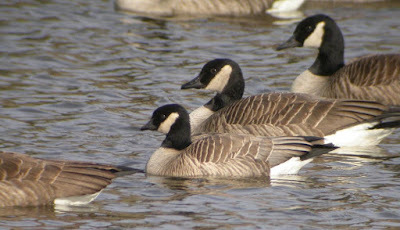 Canada Geese of all sizes, including several smaller ones with short bills. Are these "Lesser" Canada Geese? Hybrids? Could some of the smallest be Cackling Geese that just don't fit either Richardson's or Taverner's forms? (I think the last option is rather unlikely, but who knows). Please feel free to post thoughts/opinions in the Comments section below. Thanks for looking. And remember to never combine Tylenol with alcohol, as tempting as it might be! There are too many photos to comment on all at once. The past years' Cacklers are all indeed Cacklers in my estimation. The ones in photos 3 and 4 (see film-roll numbering) I'd hesitate to label as Richy's with certainty. The bill/head shape suggests that they might be intergrades with taverneri. The western AK taverneri cause a problem, as they are shaped much like the Northslope birds, but they are darker and likely call differently. But... in the end, I'd be for combining taverneri and nominate Richardson's given our current understanding. We see these variable/small Canada Geese around Lake Ontario - I call them "Todd's" or "interior" Canada Geese and they seem to travel in large groups and flock up in corn fields/large bays more than the resident birds do. They are often the birds that are packing Cacklers, but it's crazy just how small some of them look. I also find they really stand out in large bunches because of the variability they show - including some birds with very dusky/small cheek patches (http://www.peregrineprints.com/Articles/CACG8.jpg) - I can't remember where I've seen it right now, but word is these CAN's do mix a bit with CAC's, so... That adds to the fun? Great series of images!